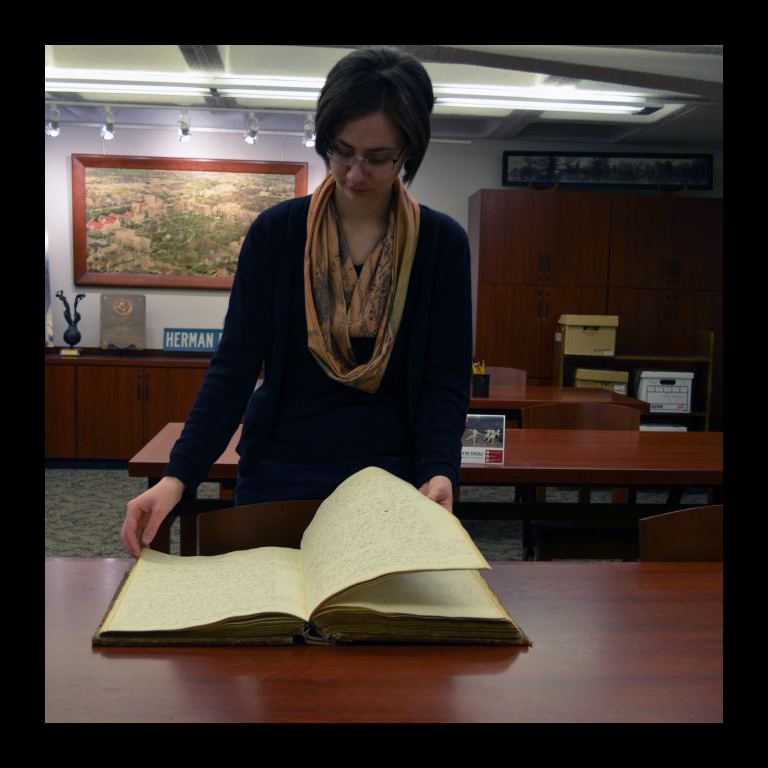 Katie Siebenaler examines the bound Indiana University Board of Trustees minutes from 1837-1859. How she got here: Katie found her way into the archives field by accident. In high school, Katie volunteered at her local public library, reshelving books and finding newspaper items for the archives’ vertical files. In college, she knew she wanted to work in public history so she set up a summer internship with the director of the museum at the local state university. However, when the director left the museum, Katie’s name was lost in the shuffle. Thinking she could find similar experience in an archive, she contacted the archivist at the public library, who she knew from her previous work, and inquired about opportunities. He happily agreed and that summer she described a collection of photographs. In her last semester of college, Katie completed an internship with the Milligan College archivist (an IU MLS graduate!). She prepared an exhibit, scanned, and began processing a collection. Before graduating from Milligan, the college archivist put her in contact with Kate Cruikshank, Political Papers Archivist at IU. This led her to reach out to the IU Archives. Katie came to IU to earn her MLS degree in the fall of 2015 and found work as a transcriber for the Board of Trustees minutes in the IU Archives and as a student worker for the Modern Political Papers. In the fall of 2016, she transitioned from transcribing to assisting with IU bicentennial projects. Favorite item in the collection: The Board of Trustees minutes from 1837 to 1859. She worked on transcribing its 400+ pages from the end of 2015 until August 2016. Working with the minutes taught her the history of the beginnings of IU as well as how to read 19th century handwriting! Her favorite part of the official record (besides some scandalous accusations against the different presidents) was running across the hiring of Robert Milligan, the namesake of her undergraduate college. Current projects: Katie works on all kinds of projects relating to the bicentennial. She recently added some scrapbooks to the GLBT support office records. She is currently processing the International Studies Collection and the Sesquicentennial Collection (and mastering spelling “sesquicentennial”). Another ongoing project is the Named Places project. For this project, Katie works from a list of named buildings to research the people behind those names. She also writes blog posts and answers reference questions. Favorite experience in the IU Archives: Katie loves working with the staff. They are very knowledgeable and make great mentors, but they are also fun to work with. Plus, some of them make some great baked goods! What she’s learned from working here: Katie feels like a semi-expert on IU in the antebellum age and during WWI, thanks to her transcription job. The Named Places project has taught her that what may appear to be an obscure dining hall or dorm may actually be named for someone with a fascinating history and connection to IU.